Situated on the 4th floor of Orchardgateway Mall along Orchard Road and decorated with modern but homely wood furnishing, Outback Steakhouse is a good choice when it comes to fill your cravings for succulent and tasty meat dishes. Be it with your friends or with the entire family, the Australian inspired restaurant chain has a large menu to make sure that everyone is happy. The cocktails are fruity, very refreshing and made with fresh ingredients such as basil, strawberries, watermelon and lemons. Appetizers such as the Spinach Artichoke Dip with house made Tortilla chips are light and come in very generous portions, making them perfect for sharing. However, it's clear that the highlights in this restaurant are the meat dishes. 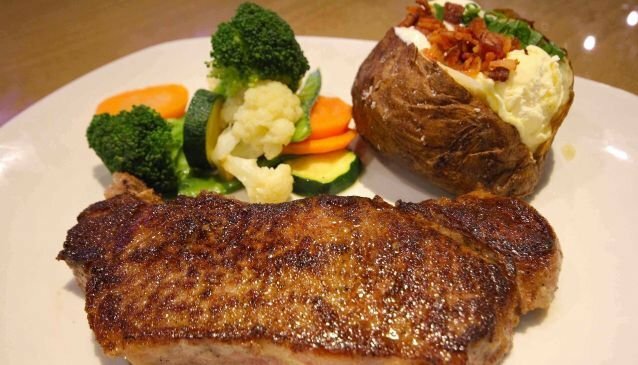 Classics such as the New York Strip steak are soft and pink. The Baby Back Ribs are so tender, they fall off the bone and melt in your mouth, while their sweet-tangy house-made BBQ glace is just right and not overpowering the deliciousness of the meat. Another popular dish is the Alice Springs Chicken, which is a flame-grilled chicken breast, topped with mushrooms, bacon and Monterey Jack and Cheddar cheese. All dishes are served with a choice of two sides such as crunchy vegetables, thick-cut Aussie fries, creamy mashed potatoes or a Sweet Baked Potato topped with honey butter and cinnamon sugar. It's so delicious, that it's tempting to order another one. When it comes to desserts, more classics with a twist await: the extravagant Chocolate Thunder from Down Under is a soft pecan brownie with vanilla ice-cream, warm chocolate sauce and whipped cream on top. The restaurant's mantra 'Quality, Freshness and Flavor' is reflected not only in the shelves of spice jars that flank the entrance but also in the well-thought out recipes.